Due to the fact that we didn’t have shrimp on hand, I tweeked the recipe just a dash. 😉 Also, the recipe called for 1/2 teaspoon of salt, but since I added the chicken juice and chicken broth, it was a touch too salty, so on here, I will alter the amounts. It takes about 30 minutes to prep and cook and it serves approximately 4. 1. Heat oil in large saucepan over medium heat. Add onion, carrot, celery, chopped fennel and cook until softened (approximately 6-8 min). Stir in tomato paste. 2. Add chicken, chicken bouillon, tomatoes and juices, and 1.25 cups of water to saucepan. Season with 1/4 teaspoon salt and 1/4 teaspoon pepper. 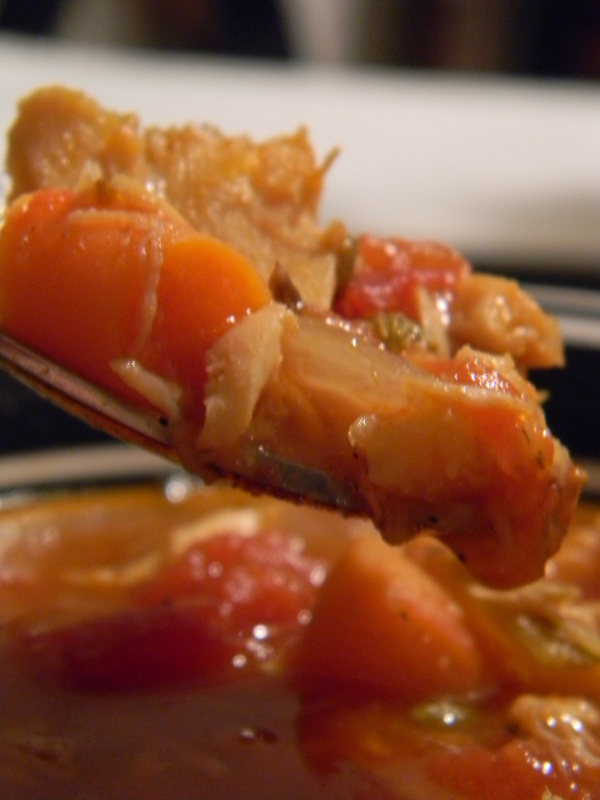 Simmer until chicken and carrots are cooked.